Uniquely contoured rigid metal design allows you to isolate your arms and shoulders while keeping your back and elbows locked in the perfect curling position. The strap features a quick release to adjust it to the perfect position. The straps are secured with double rivets for extra security. Key Features *Uniquely contoured rigid metal design allows you to isolate your arms and shoulders. * Ergonomic design to fit perfectly around the torso. * This arm blaster is a simple device to use. * The bicep blaster is ideal if you are looking to bulk up your biceps, consisting of a webbed nylon belt, which has a thick neoprene neck pad for comfort and dense elbow pads. * It will help isolate your arms and shoulder while performing dumbbell or barbell curls. * It has a uniquely contoured and ergonomic design to fit perfectly around the torso with a quick release adjustable strap for perfect positioning. * This arm blaster ensures arms are not moved at shoulder joints and arms are held at correct position. * This enables fuller pump, total muscle fatigue and stimulating maximum muscle growth. 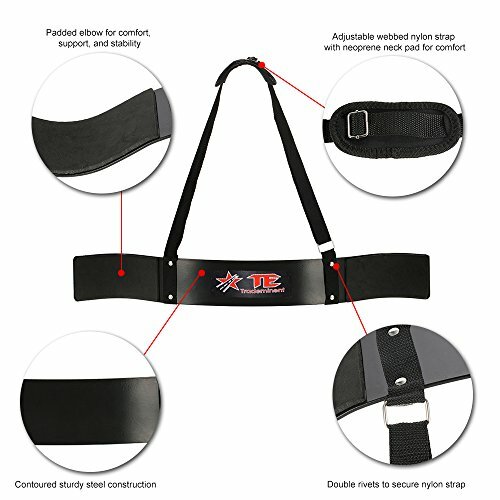 * Unique Contoured Design Isolates arms and shoulders while you perform dumbbell. * Heavy Duty Nylon Webbing, Neoprene Neck Pad and High * Density Elbow pads protection. * Quick and Easy Release Adjustable Strap * Sold as individual item * One size fits all. Arm Blaster (Bicep Blaster) Product Description Our arm blaster is a fantastic tool, when coupled with an optimized training regime you can achieve some fantastic results. An arm blaster is a harness with a metal plate. The harness slides over your neck, allowing you to lock your arms into the grooved sections of each side of the arm blaster's metal plate. Due to our supreme design, you will now be able to have blood pump a lot quicker to your biceps and forearms allowing more energy to be used up, and thus increasing the size of the overall muscles used, without causing quick fatuousness. The Trademinent new biceps isolator now imitates the preacher curl movement, however this will not require the user to sacrifice any space as it is a portable piece of exercise equipment. If you have any questions about this product by Trademinent, contact us by completing and submitting the form below. If you are looking for a specif part number, please include it with your message.